geographyofindia.wordpress.com. November 2013. There have been numerous arguments in favour of improving and upgrading the infrastructure of slum settlements, many of which are interrelated. It has been shown by studies that improving living conditions can bring gains to the quality of life, health, and productivity of slum residents. As a recent study by Benjamin Stanwix, a South African scholar, for Mahila Housing Sewa Trust, Ahmedabad, states, “ It can help to break the cycle of poverty, ease the burden on women, and can also be a public good with positive spill-over effects on the wider economy and society. 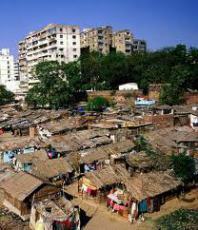 These arguments have been discussed in more detail below.” The study, titled “Urban Slums in Gujarat and Rajasthan: Study of Basic Infrastructure in Seven Cities” (2009) notes, life in the absence of adequate access to basic services such as water and ablutions can be precarious. It is detrimental to health, safety and the dignity of communities. It quotes a UN Habitat study which shows that lack of safe drinking water and poor sanitation can lead to a range of diseases, while factors such as overcrowding and pollution can also contribute to health problems.